Today is our last rest and preparation day in Saint-Jean-Pied-de-Port. We have spent the last twelve days hiking and preparing, essentially, for tomorrow: The Pyrenees Mountains. For me, this is otherwise known as the first day of the rest of our lives, ahem, I mean our hike. There are several routes to make a pilgrimage to Santiago de Compostela including beginning in Valencia or Barcelona, starting at the southern tip of Portugal, and even hiking from Paris or beyond, etc. Some people do even shorter overall hikes in their personal quest to walk into Santiago, such as beginning in Roncesvalles in order to skip the great challenge of the Pyrenees Mountains, starting in Pamplona or Burgos, in order to create a much shorter pilgrimage, or hiking from Leon in order to skip the heat of the desert Meseta region altogether. 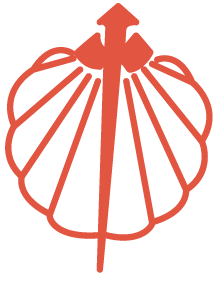 Some pilgrims even chose to only hike the final 120 kilometers from Santiago, starting in Sarria, in order to have the shortest possible route to still qualify for a “Santiago Compostela” certificate. SJPDD is the most popular start. We chose to start in Lourdes, France, which added an additional 8 days of hiking. Hiking from Lourdes to SJPDP was a sacrifice Shannon and I decided to make, because my mom’s name was Lourdes. It was however a very separate journey, than what I think the “rest” of El Camino will end up being. To be clear, I am hiking El Camino de Santiago not only for myself, and not only to complete a journey such as this with my life partner, but also in memoriam to my mother. But I feel in my heart, our journey from Lourdes until where we are today, in Saint-Jean, was a pilgrimage that was/is different from what I believe the rest of our hike will feel like. We have read that once we cross over the Pyrenees Mountains, there will be constant yellow arrow markers guiding pilgrims along their way. We have also read that once we begin our ascent into these beautiful mountains, we will probably never hike another day without at least one other pilgrim, if not hordes, literally hundreds of pilgrims. Up until today, we have only seen two other pilgrims- in 8 days of actual hiking! We have gotten lost, due to inadequate signage, countless times. We have hiked into villages, where people looked at us like we were crazy. We have suffered and laughed, cried, and rejoiced- sometimes in the middle of literally nowhere. And it has been wonderful. I feel fortunate and blessed that Shannon and I have had this journey up until today. I am glad that we have finally fully “broken-in” our hiking legs. Blisters have been painfully experienced. Today, I was finally able to buy a new pair of proper hiking boots. We have landed in the first town that actually has a Pilgrim store; one where we could buy an English El Camino guide book and search for other gear and trinkets we might need. Today, as we had a meal in the heart of town, we witnessed pilgrims everywhere. EVERYWHERE! People toting oversized backpacks and hiking sticks. This is the starting place for so many of these pilgrims that are 100% newbies. We chuckled knowingly as we saw the bulk and weight on their backs. They’ll learn on their own soon enough, that they will need to shed a massive amount of weight. We see people that were nervous and excited, ready to begin their journey. And we have been on our own journey now, for what seems like an eternity, although less than two weeks. But everything is about to change. So up until now, we have hiked another hike. One completely in the spirit of my mom’s spirit, even though the rest of the hike is still in her memory. But tomorrow, we start El Camino de Santiago de Compostela. Tomorrow everything will be different. Not better; not worse; not easier or harder. It’s just the right time for change… into the rest of our hike, and the rest of our lives. 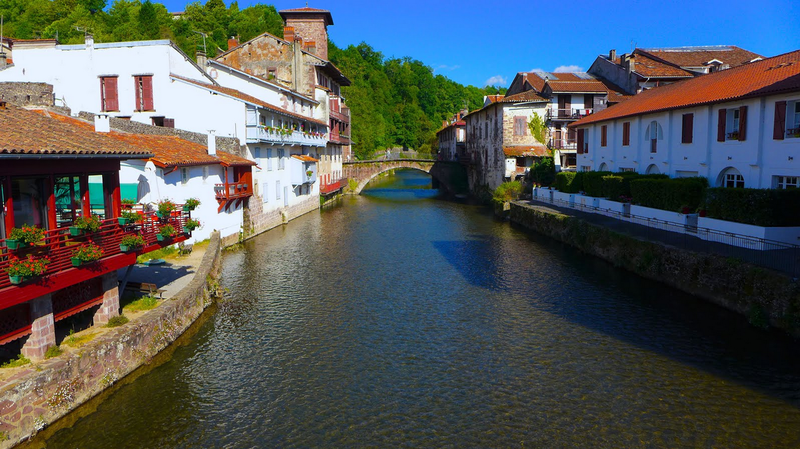 Saint-Jean-Pied-de-Port is a gorgeous, vibrant city, ever since the Middle Ages, and at the epicenter of the Basque culture. There is no better time to do laundry than on our non-hiking days. Shannon and I have come up with the best system. She is the master washer, and I squeegee every last drop of water out, like it’s nobodies business! Laundry days require good clothing drying spots. 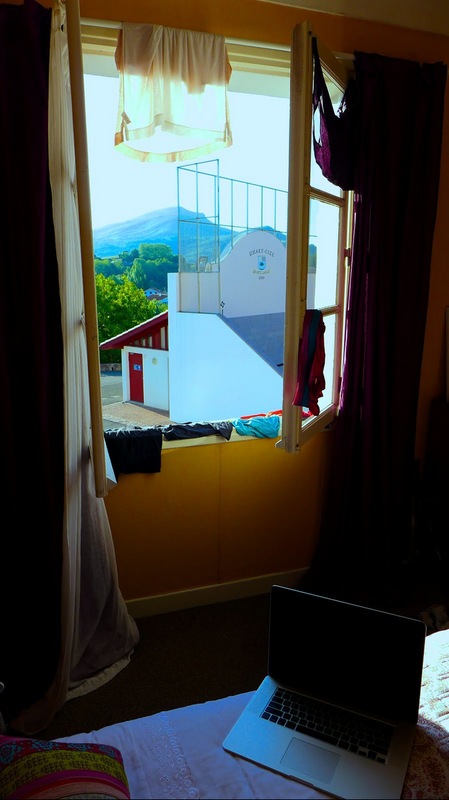 What better spot to dry our stuff, than a place where we can also look out to the beauty of the Pyrenees Mountains? What a gorgeous day!